12A · 2h 12m · 2019. Action · Adventure · Comedy · Fantasy. Asher Angel · Djimon Hounsou · Grace Fulton · Jack Dylan Grazer · Mark Strong · Michelle Borth · Zachary Levi. Darren Lemke (story) · Henry Gayden (screenplay and story). Bill Parker · C. C. Beck. bleeped strong language · horror · innuendo · moderate violence · threat. After the huge success of their solo movies Wonder Woman (2017) and Aquaman (2018), the DCEU seems to be finally moving in the right direction. For a long time, the studio tried desperately to emulate the MCU formula by building their own densely interconnected universe. Arguably failing in that endeavour, they eventually found their groove by concentrating on developing good stand-alone movies. They've also begun injecting a good dose of fun into these films instead of trying to make them overly dark and gritty. 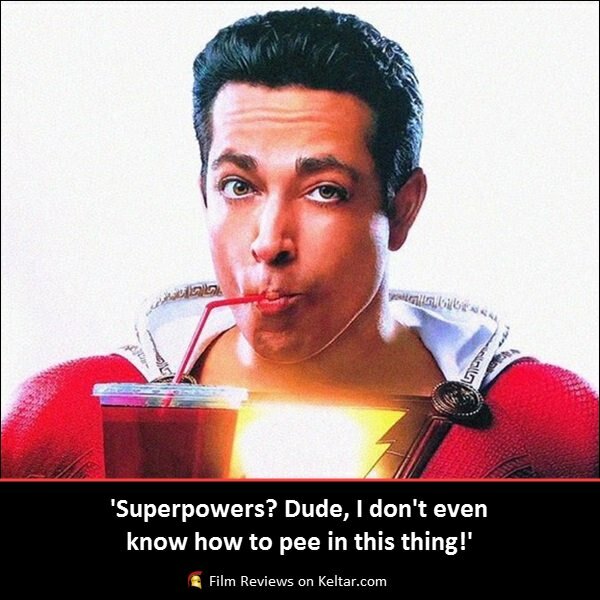 Continuing that trend, the latest DC film Shazam! has no connection to the Justice League (2017) and could actually be considered an outright comedy. 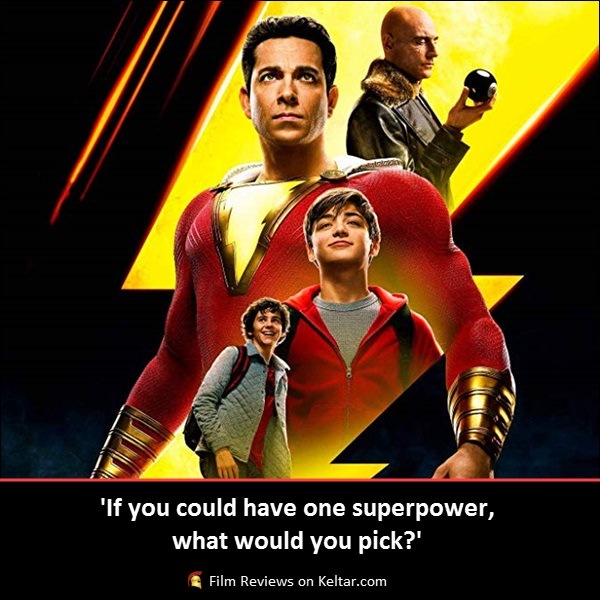 Directed by David F. Sandberg, the story follows fourteen-year-old orphan Billy Batson (Asher Angel). When he is put with a new foster family, he is forced to bond with superhero fanatic Freddie (Jack Dylan Grazer). One day, Billy is magically whisked away by a wizard (Djimon Hounsou) and imbued with superpowers. Transforming into an adult (Zachary Levi) when shouting out the wizard's name, 'SHAZAM! ', Billy enlists the help of Freddie on how to use these new abilities. Building up a reputation, it's not long before he draws the attention of supervillain Thaddeus Sivana (Mark Strong), who wants the power for himself. Following in the footsteps of James Wan, horror director Sandberg moves out of his comfort zone. 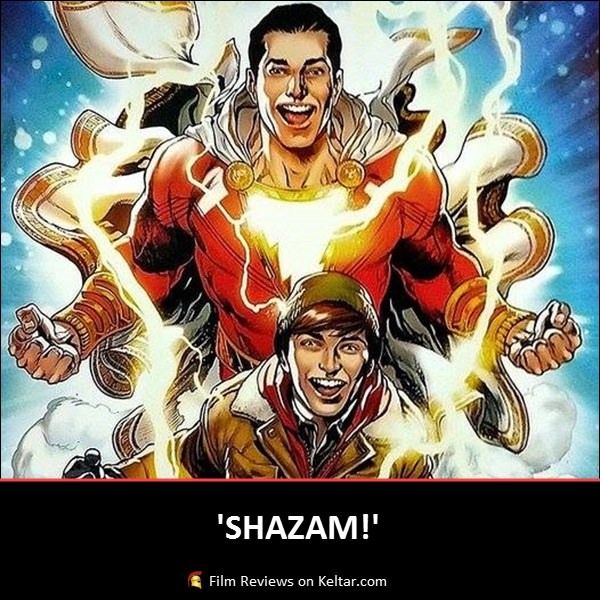 Unlike Wan and his lengthy filmography, Shazam! is only Sandberg's third movie after Lights Out (2016) and Annabelle: Creation (2017). Happily, he more than succeeds and offers another entertaining DC instalment not long after the popular Aquaman. What's more, this is a character who hasn't turned up or been referenced in previous DC movies. Meaning you can walk into this and not feel like you should have watched all the other films to make sense of everything. Another positive aspect of this movie is the more optimistic and joyous tone. It makes a pleasant change to have a character who actually loves having these superpowers and revels in them. There's no angst over what a curse they are like Spider-man, or a dead loved one that compels them to vigilantism. The main driving force of Billy is just to have fun. Even the MCU of late is full of depressed and heavily burdened heroes. It's a breath of fresh air to have a superhero with a sense of wonder over what has happened to them and is just enjoying the experience. Coming with that upbeat approach, is a fair amount of comedy that Sandberg deftly executes. Considering he's known more for horror, he aptly knows how to bring out the humour of the situation. Doing this by leaning into that absurd concept of a literal man-child superhero, which is just naturally funny to see play out on screen. Besides that, for what could have been just another origins story, Shazam! is aided by its very original source material. The tale of a boy who can turn into a super-powered adult by saying a magic word feels really unique. Helping it stand-out, it's unusual to most other individuals’ journeys to becoming superheroes. Despite that levity, it's not all about the comedic antics. Sandberg makes sure there's enough heart to make the movie emotionally engaging as well entertaining. He achieves that by having a great cast with solid character development for the actors to work with. Angel is brilliant as that loner kid who has to learn to trust others. Through the course of the film he authentically portrays a toughness mixed with vulnerability. Him learning to become a real hero is a believable arc he goes through. As his adult counterpart Levi is just as good, and together, both him and Angel act like the same person. They both have a genuine chemistry with Glazer's Freddie, who becomes Billy's confidante and gets some of the best lines. Some attempt has even been made to flesh-out Strong's antagonist. He's not just a bland world-conquering villain, but has an interesting motivation for the things he does. Strong has always made a good baddie, and he slots seamlessly into this heightened comic world. Looking like he's enjoying it, he holds his own alongside the lighter Billy, being the antithesis of what the hero stands for. On top of that, Sandberg expertly delivers when it comes to the comic book action. There's some excellent set pieces that do exactly what they need to do: like excite and thrill. Yet, by infusing them with that playful tone, he also is able to have fun with them and let them play out in a fresher way. That typical loud and big third act finale is even different from the majority of these type of movies. CGI is also utilised really well, and never feels overused. Shazam! is definitely another success for the DCEU. By ridding itself of the burden of having to connect to a larger story, it's allowed to be its own thing. Knowingly funny, it isn't afraid to poke fun at its own superhero tropes either, while also adhering to them at the same time. With a lighter tone and some solid performances from the main leads, there's plenty of heart in this DC movie everyone will enjoy. A streetwise foster kid becomes a champion for good and is given the power to turn into adult superhero Shazam. Review by David Axcell. This article is copyright owned by Keltar Limited. All rights reserved. Plagiarism or unauthorised copying is not permitted. All other copyrights remain the property of their respective owners. Posters, images and quotes credit: Shazam! (2019) production and distribution companies. Trailer credit: Warner Bros. Pictures – YouTube.